Our story began 130 years ago with a parcel of donated land, $3000, and less than 20 resident Catholics in the Sandhills region. In September 1955, St. Anthony's opened a parochial school to meet the needs of children from both St. Anthony and Sacred Heart Parishes. St. Anthony of Padua Roman Catholic Church was established in 1885. John T. Patrick, founder of Southern Pines, donated the land on the corner of East Vermont and North Ashe Streets for the construction of the church. Dedicated to St. Anthony of Padua in 1895, the humble, little church served as a mission church of St. Patrick’s in Fayetteville for over 10 years. St. Anthony’s was only the second church ever built in Southern Pines. In 1911, Father William Dillon became pastor of St. Anthony’s and oversaw the construction of Sacred Heart Church in Pinehurst, which served as a mission church of St. Anthony’s for the next 15 years until Father Dillon became Sacred Heart’s first pastor. The 1920's saw growth in the area’s church membership. This resulted in the extension and addition of two wings to the sanctuary of St. Anthony’s, which provided seating for 175. As the parish grew, it needed larger church facilities. Construction on the new church began on April 26, 1973, and the school auditorium served as the place of worship until completion of the new 450-seat facility. This new church was dedicated on December 18, 1975. Built at a cost of $380,000, the church paid off the building debt in 1980 (three years ahead of schedule), thanks to the concerted fundraising efforts by parishioners. In September 1955, St. Anthony’s opened a parochial school to meet the needs of children from both St. Anthony and Sacred Heart Parishes. In 1971, St. Anthony’s school closed, not to reopen until the fall of 2002. 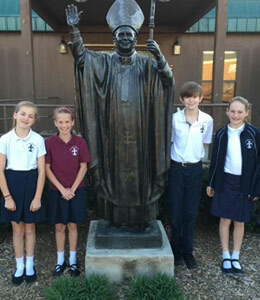 In 2005, the school was renamed Pope John Paul II in honor of our late Holy Father and also to reflect the school’s regional nature, as it serves families of Moore County, Hoke County, Ft. Bragg, and surrounding areas. With enrollment nearly doubling in 2008, construction began in 2009 on a new school located on 22 acres near Belle Meade. To accommodate our increased numbers, the interim modular buildings opened in the fall of 2010. With much hope, many prayers, and the generosity of our loving church community, we anticipate beginning construction of the long awaited activity center. 1885 – St. Anthony of Padua established in Southern Pines. 1895 – First Catholic building dedicated in Southern Pines. 1895-1906 – St. Anthony’s serves as a mission church of St. Patrick’s in Fayetteville. 1911 – Father Dillon becomes pastor of St. Anthony’s. He oversees construction of Sacred Heart in Pinehurst. 1915 – Sacred Heart building completed and serves as a mission church of St. Anthony’s. 1920s – St. Anthony extends sanctuary and adds two wings providing seating for 175. 1935 – Father Dillon appointed Sacred Heart’s first pastor. 1955 – St. Anthony’s parochial school opens. 1971 – St. Anthony’s school closes. 1973 – Original church raised; auditorium serves as worship place. 1975 – New church seating 450 completed. 1980 – New church construction debt paid off. 2002 – St. Anthony’s school reopens. 2005 – School renamed Pope John Paul II. 2008 – School enrollment increases from 78 to 150 students. 2009 – Construction begins on a new school near Belle Meade. 2010 – Interim modular school building opens. 2014 – School renamed Saint John Paul II.